I have to believe that every mother out there has days that a lounge outfit is in order. I have those days, recently they are far more frequent as clothes get more and more uncomfortable. For so long I was quick to put my children in their designer jeans and button up shirts, until one day I came to the conclusion that they needed lounge days too (though their lounge days are much cuter than mine). I have come around to comfortable and soft cottons, they've improved drastically in the last 5 years and Tailored Tadpole is living proof. These lounge outfits are to die for. So soft, so comfortable and on top of it stylish. The best part, I'm happy to leave the house with the kids in clothing they can actually breathe in. But lounge suits aren't all the Tailored Tadpole makes. Their organic cotton tees are fresh and fun, their blankets - the ultimate in modern funky designs and micro-fiber softness, and their pillow cases well the name suits them well. The Ultimate Pillowcase. Since the day ours arrived the girls have fought over who would sleep on the soft pink pillow. They absolutely love it, but I love it too, not for the fighting that ensues but because it is hypoallergenic and stain resistant. Absolutely perfect. Today the Tailored Tadpole is giving one Tangled and True their choice of lounge suit and pillowcase... how will you decide? Which Tailored Tadpole design is your favorite? I LOVE the Safari pattern pillow case! They have such fun patterns and designs in their collection! Love the Lollitree leisure suit. My little guy would look so cute in the Rock It lounge set! Great stuff. I love the Paperbird pattern. The blanket would be the perfect to cuddle with, no matter what your age! I love the LOLLITREES, how adorable for my baby who loves to lounge! Great stuff. for my boy I really like Zoom! I love the elephant and the lollitree. All very cute! I love the lollitree lounge outfit! So cute! i would pick the adorable lolly tree lounge set! I love the Eli suit and the Zoom pillowcase! It is all so cute, though. Love the Eli Elephant set, Climber tee and the Eclipse pillowcase. Fun site, thanks for sharing! Pretty sure my daughter would love the ellie lounge set even more than I do, and the karma turquoise design is perfect for that soft pillow case. The lollitree leisure suit for sure! So so cute. Hi, The LollyTree Lounge Set is my favorite! Please add my name to your adorable giveaway contest drawing. I love all things pink. My little girl would look so sweet! These are so adorable! the lollitree leisure suit is my first choice. I would love to win the Rock It outfit. My little guy has crazy hair like a rock star, so a rock star outfit would be perfect for him. My little boys would love the zoom or safari pillowcase! I'm digging Elie the Elephant. It's too cute - the louge set, t-shirt, body suit. I love it all. I am in mad love with the Safari pattern! Love the Lolly Tree too! Super cute stuff! Gotta go with the Rock-It. The Eli Lounger set is adorable!! I love the lollitree it would be the perfect thing for when my little girl arrives! 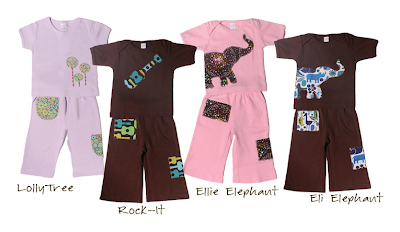 Love the Ellie Elephant pattern! I think that question could only be answered if I actually won and the pressure was on. I truly can't decide! These outfits look so comfortable and adorable! I really like the Lollitree design-tres chic. Thanks! I would love a Kharma pillowcase!! They both sound so snuggly! Perfect. we love the Rock it pattern. So hip and cool. Thanks. Ooooh, love it! The safari pillowcase witht Eli elephant lounge outfit. So fun! I love the Karma blanket. So cute! I also love the little skirts. How fun! Gush Gush! Love Eli Elephant clothing or Karma Brown blankies and burps! The Climber is also quite darling! Ellie the Elephant! So cute! I love the Karma Swing dress! Adorable. Rock-it is definiely my favorite. I love the elephant lounge set. My kids pretty much wear lounge clothes everyday! I like the giggles pattern for the pillowcase, and Rock It for the lounge set. k, the elephant set is too cute. want it. need it. hope i win! The "Lollytree" lounge suit and the "Giggle" pillowcase would both be perfect for my little girl! Oh, it would have to be the Ellie the Elephant for my little Ellie! I love the Ellie the Elephant lounge pattern and the paperbird pillow case. Thanks! I love the Lolly Tree lounge set for my 14 month old. I'd love one in my size, too! I would get the rock it lounge set for my little guy and the paperbird pillowcase for my little girl. I'm really loving the swing tops and petal pants. Cute! oh man, we are having a lounge day today, I love looking at my kids in lounge outfits, but I have a hard time finding cute stuff...so I think I would choose Ellie Elephant or Rock-it for the lounge, and I can not even choose for the pillow case...seriously, so fetchin' cute....I think i would get one of each if I could! I'm loving the Rock It pattern! I'm a big fan of the Lolly Tree and the kharma pillowcase. Cute stuff. Makes me want to lounge myself. I love the lollitrees like whoa. do these come in my size??? The Ellie Elephant design is super cute. The Lolli; love the lavender. And that beautiful Paperbird. Safari pillowcase and Eli Elephant lounge set. Love the giggles pattern. So cute. Love the "rock it" design! So fun! i love the unique rock it set! Eli Elephant is seriously so cute...and my little one would LOVE a pillow with cars on it so "zoom" is our winner pillowcase! and for the pillowcase, i would probably choose paperbird, although it's a tough call. so many great designs. I love the giggles design! This pillow case sounds great. i'd choose the Giggles design. And the Eli Eliphant lounge set for my baby boy. Our little boy would love the Rock-it pillowcase because he LOVES guitars. So fun! I'm an elephant lover. I love Ellie the Elephant! Would look super cute on my little Joselyn. I adore the Lolly tree and the elephants. Picking one would be so hard. The Zoom pillowcase and the Rock-It! lounger! So cute! The Lollie Tree please! Too cute! love the Rock it lounge suit. so cute. crossing my fingers that i get this for my little boys first birthday. loving the eli elephant...just perfect for my little boy ELI!! I love the rock it leisure suit. How sweet! The zoom pillow case is just adorable and the Eli Elephant lounge set is to die for! I love the lollitree & the giggle pillowcase. Too cute! Very cute! I love the "lolly tree" and the "paperbird" print. The safari pattern is my favorite! I love the Lolly Tree body suit. I love the Paperbird fabric! The Ellie outfit is darling! Love, Love, Love it!!! My little animal lover would LOVE the Elephant lounge set. He would look absolutely adorable! The brown Karma pillowcase is so Klimt...love it! I love the Eli Elephant and the Eclipse pillow case. That microfiber is such a great idea! i love the rock it outfit. it's adorable! Linde & Tailored Tadpole are the best! I LOVE all the designs, but the Lolli Tree is my fave! 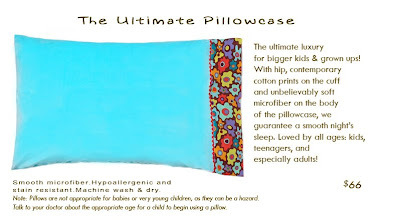 i LOVE the zoom pillowcase for the boys and the ellie elephant lounge set for the girl! adorable! how do you find the most amazing companies?? Those lounge suits are ridiculously cute! And they look so comfy too! I bet my 2-year-old daughter would want to wear it all of the time. If not, I can always save it for her little sister (due in March). I especially love the Ellie Elephant design. So girly. So original. So fun. Are the suits handmade? I love the Ellie loungeset, and I'd do the pillowcase in Karma. Very cute! love the lollitree lounge outfit. their stuff is really cute. I like Eli Elephant and the Zoom pillowcase for Jasper. I love the safari pattern. So cute! Thanks! I love the Ellie Elephant t-shirt. I love the elephant. Super cute! Hope I win! My little guy would love Eli Elephant and the matching Safari pillow case...he loves animals! We really NEEEEEEEED the rock it lounge set!! The rock it suit would be perfect for my lil guy!! What great stuff, awesome pillow cases...I think I would keep that for myself! The lounge suit in Rock It! is so cool. And the pillowcases -- oooh, a difficult choice. I'm going with the Karma 015. Thanks for the giveaway. Love the Lolly Tree (purple is a color my daughter does not have - weirdly enough) lounge set and the telescope pillowcase. Looks so comfy! The lolli tree suit is too cute! But my personal favorite is the pillow case! My oh my that sounds heavenly right about now. My pattern of choice is the paperbird, so chic. Michele Ondra: Ellie the Elephant lounge set!!!! Love all the leasure suits very cute! My favourite is the paperbird pattern! The Eli Elephant is my favorite. Tailored Tadpole is such a special collection with wonderful blankets. Ps. I love your blog, I got the link from my photographer! i love the Eli Elephant style on the lounge suit and shirts. And i love the Paperbird blanket too! the Eli Elephant lounge suit for boys. Super cute! Lauren loves the "Rock it" for her little boy or the "Ellie Elephant" for her little girl. How to decide...! We love the Safari pattern! So cute! So Cute! I love the Rock it! I love the zoom deck pants. Our little band member would love Rock-It! I love the Eli elephant lounge set in brown. Really cute! I love the eclipse pillow. great for visiting granddaughters.